According to the CRTA election observation mission, a total of 48,2 percent of citizens registered in the voters list have voted at the Belgrade City Council elections until 7 pm. Margin of error was +/- 0,4 percent. 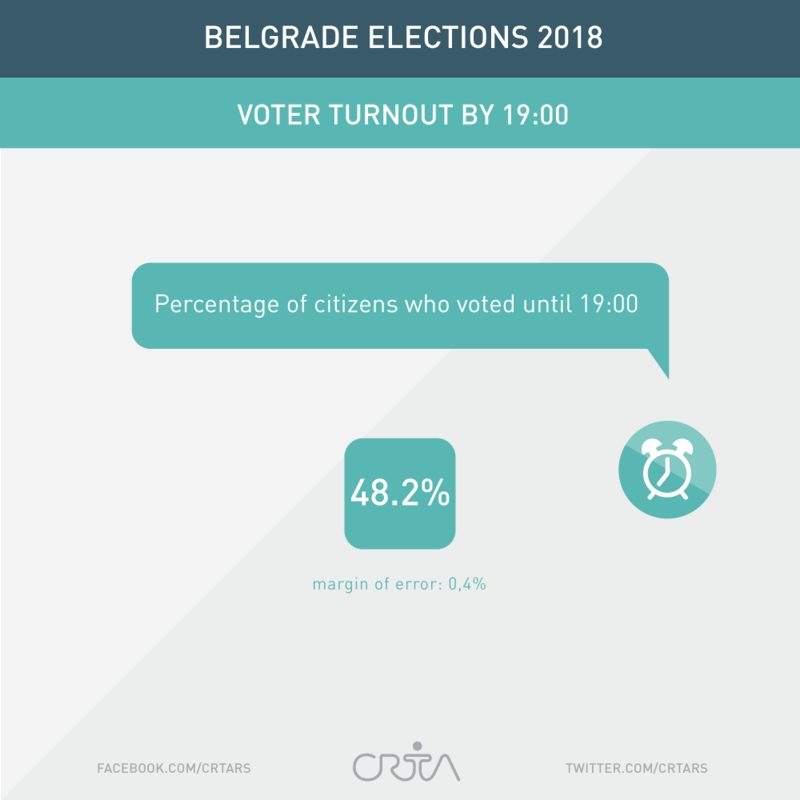 CRTA’s monitoring of the Belgrade elections is based on statistical principles that allow the effective and systemic observation of the election process on the day of the vote. CRTA uses the parallel vote tabulation methodology (PVT) that enables the assessment of the overall voting process on the Election Day – opening of polling stations, voting process and vote count – in an unbiased and systematic manner. PVT methodology uses a random and representative sample of polling stations, meaning that the results are representative for the entire territory. CRTA is a member of the global and European networks of election monitoring organizations – GNDEM and ENEMO. CRTA election observation mission will issue the next public statement at 8.15pm. You may follow the conference live at the website CRTA.rs or at the Facebook page CRTA.rs.